Until now the Sooty Saddlebags, a tropical species normally found in central and South America as well as in the Caribbean islands (e.g., Meurgey 2007: Argia 19/3, 11-13), had been found four times in the US, three of which in Arizona (2005: Pinal Co. - Bailowitz, personal comm; 2009: Graham Co. - Bailowitz and Danforth 2009: Argia 24/3, 28; and again 2009, Pinal Co. - see link at bottom of this page). On 3 November 2012 a sub-adult male of this species (photos below) was found at Papago Park in Phoenix, Maricopa Co., AZ. 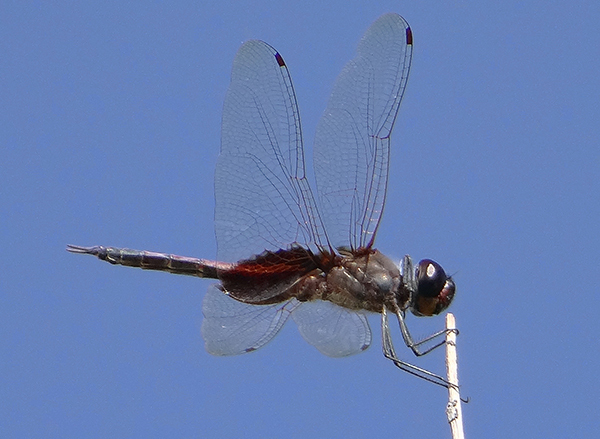 This individual was observed for several minutes perched at the top of small tree near a pond that also held Black Saddlebags, Tramea lacerata, Striped Saddlebags, T. calverti, and earlier in the season, Red Saddlebags, T. onusta. It could not be relocated the following day. This observation provides the northernmost record of the species to date as well as a new county record, the fourth Arizona record, and the fifth US record.